Back in Spain there were immediate cycling improvements, better surface, shoulder to ride in, kinder traffic. We were on roads that had previously been the main road, but were now secondary to the expensive newer auto pistes. The two ran almost completely parallel and there was hardly any traffic on either. On the high plains we could see for miles, mainly flat but occasionally snowy mountain tops were clear in the distance. The sun took ages to set, we had 360 degree orange, and arrived at the campsite in Ciudad Rodrigo in the dark. Unsurprisingly there were no other tents. The walled city looked magical lit up at night, a great back drop to our quickly-eat-before-it-gets-cold dinner. The campsite had a bar which steadily emptied as we were cooking. We went in for hot chocolate and saw the debris of a rip-roaring Saturday night. Napkins and cocktail sticks littered the floor. Some serious tapas had been eaten that evening. Which direction will the next car pass us in? How many minutes/kms until the next field of cows? How many cars will pass us before the village of some saints head? When the excitement got too much we returned to naming songs by a group/artist until you can’t think of any more. 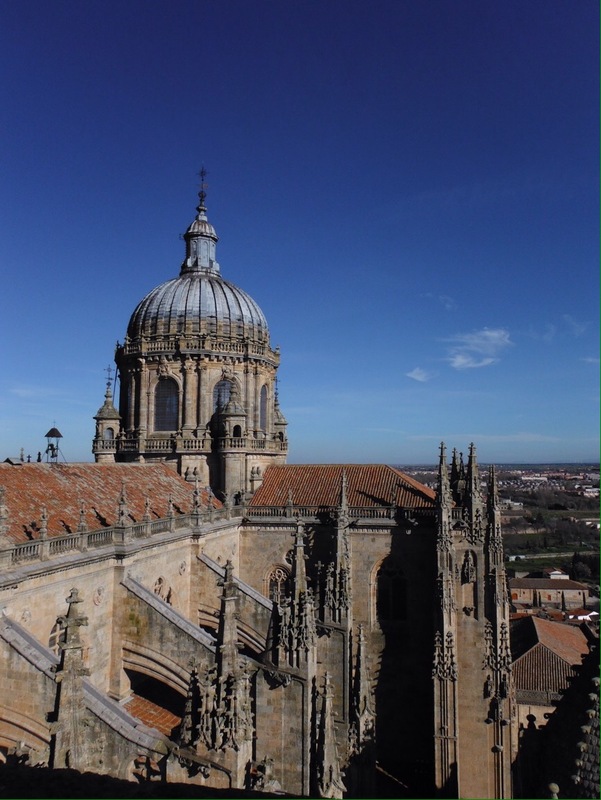 Fortunately when we finally saw Salamanca it looked awesome. Even from a distance it was clear there were plenty of impressive buildings. Most of the city centre was made of similar stone, sandy coloured and very well maintained. 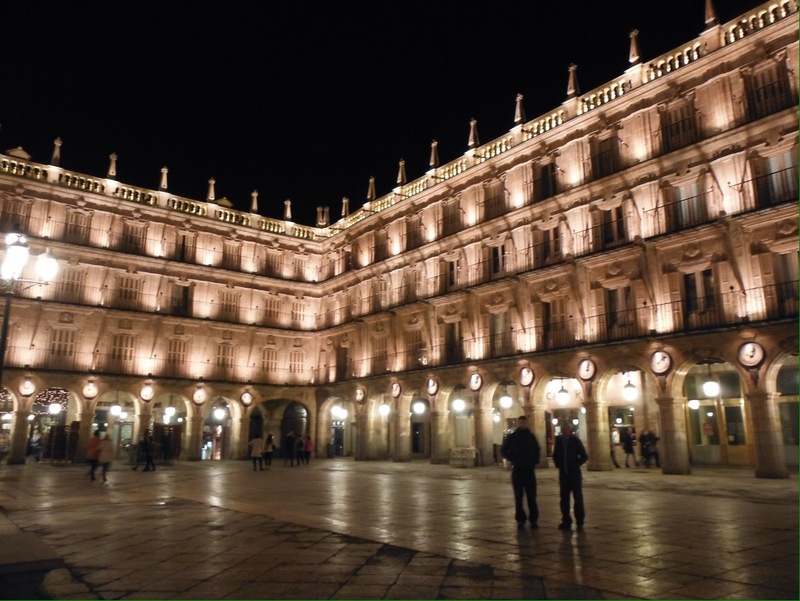 The Plaza Mejor was super-fancy – probably the most pleasing of all the squares we had seen. The city looked great by night and day, helped by blue skies and sunshine. Our amazing hosts Javier and Pedro showed us some great tapas places, and the mystery of the debris on the floor of the tame campsite bar was solved, this is what you do with your Pinchos litter. We also caught up with our Christmas presents via Catherine from New Zealand whose month studying in Salamanca coincided with our visit. The best square of the trip? Salamanca seemed a very liveable Spanish city. The downside is that it is still a long way from anywhere. This was particularly important for us as weather reports showed that cold was about to get colder and more unpleasant in every way. Snow storms were forecast for Northern Spain, with much snow above 300m in the region that separated us from the coast and our ferry home. As we were still over 800m with some passes to ride over before dropping down, it was time to get a shift on. 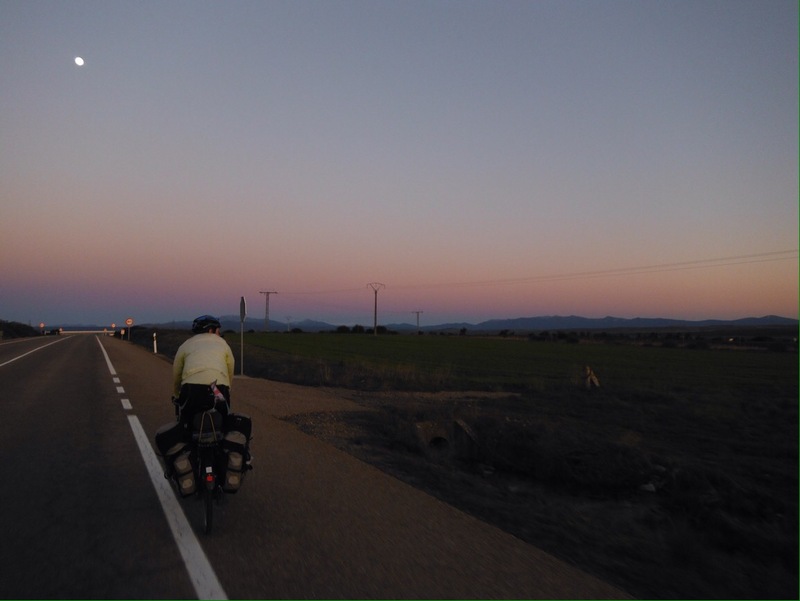 For the first time in Spain the wind agreed and we rode the easiest fifty miles of the trip. We arrived in Medina del Campo in time to look at the castle and enjoy relaxing at Paco’s with two very cute cats. The weather was not to be our friend for long, the rain heavy and the wind strong. It was clear that to get to Bilbao safely we needed some help. Cutting out some of the distance with a fifty minute train journey gave us a 50km ride to the end of Bilbao’s commuter rail line. 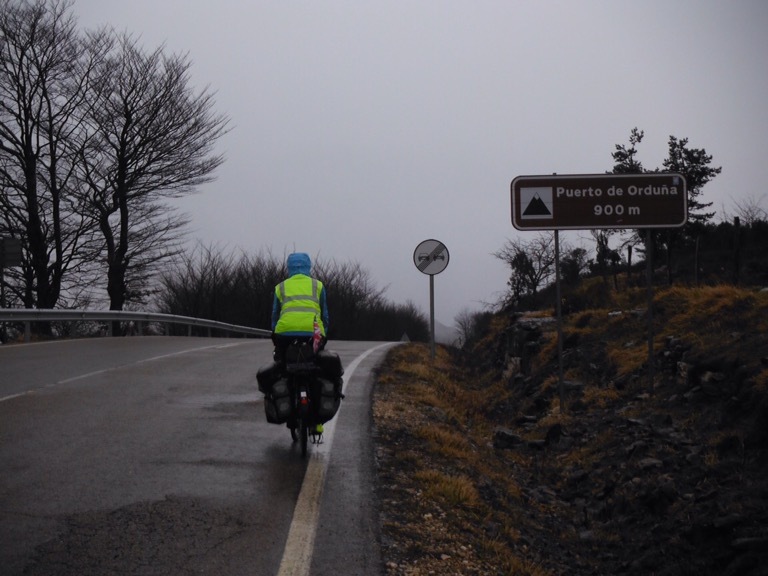 Unfortunately the 50km included a 500m+ climb and the most technical descent of the trip in rain and fog. 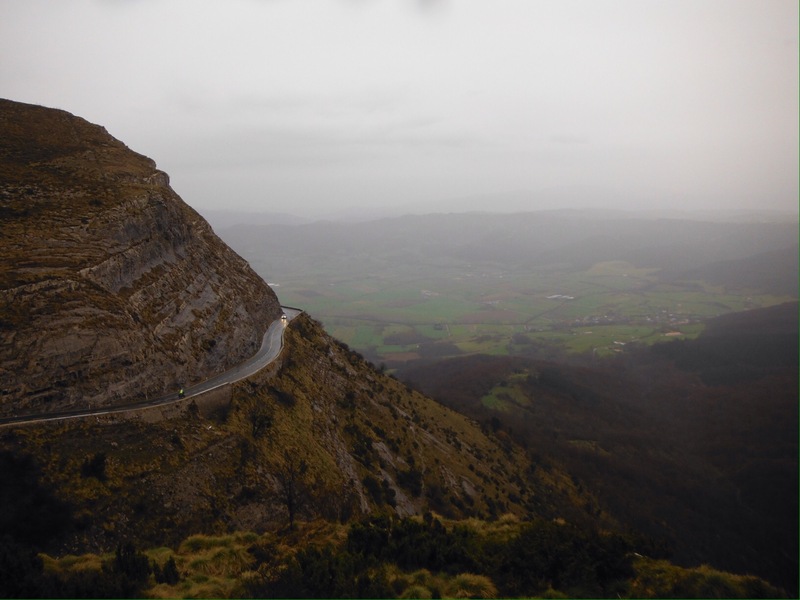 Not far from Bilbao, the descent we did has been a climb in the Vuelta. Never has a warm house been more welcome than that Friday night. The rain was relentless and continued until all weekend. Being stubborn we went for a soggy walk but the deluge made it difficult to enjoy the sights. Cycling to the ferry we experienced a very unique bridge. It had been included directions given to us by a local cyclist, who described it as ‘not usual’. Definitely not, but I won’t spoil the surprise if you haven’t been. 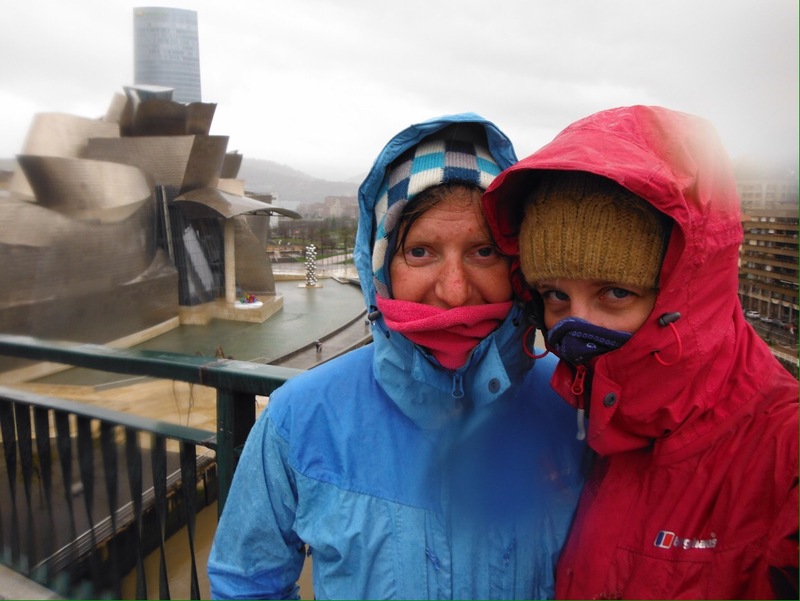 The rain began again as we rode through the endless port area and we were very relieved when the ferry staff waved us straight onto the boat and out of the rain on Sunday afternoon. I’m not sure I can fully explain the relief and relaxation of a long boat or train journey after a lot of moving around. You know exactly where you will sleep. 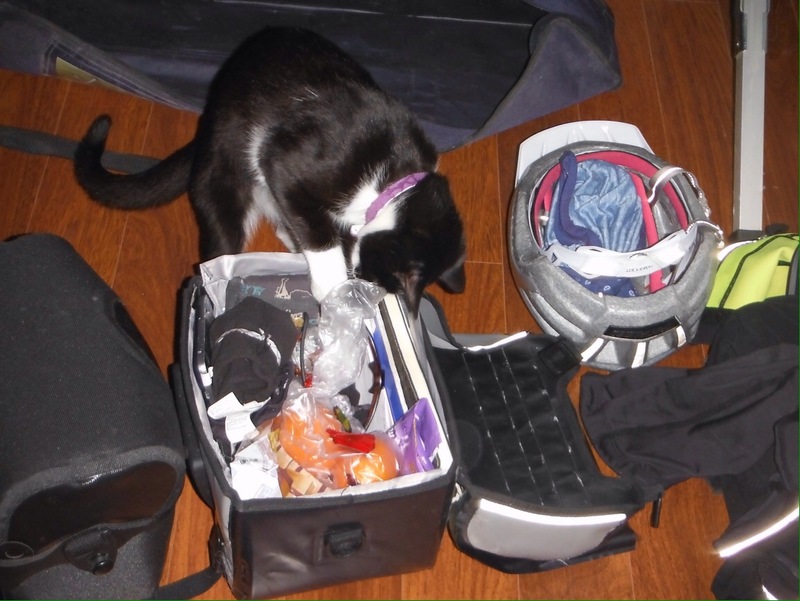 You have packed yourself an excellent and extensive array of picnic food. You have books to read, and if you are lucky (we were) the ferry has board games so you can spend an entire day playing scrabble. If you are really lucky you can speak to people in your own language who think your cycling trip is really interesting (thanks Brits on tour). If your luck is at maximum you have some family who live close to the port at the end of your journey for food, sleep and great conversation (amazing stay in Hampshire). Home time! Thanks for this ride to: Javi & Pedro, Paco, Raul, Rafa & family, Shelagh, Joss, Emma & Alex.